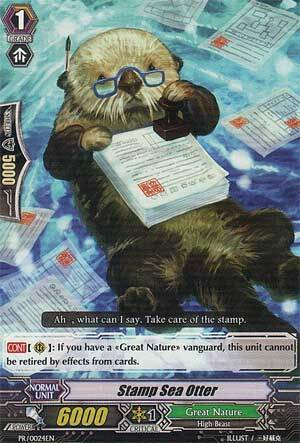 [CONT](RC):If you have a «Great Nature» vanguard, this unit cannot be retired by effects from cards. ...I have a pretty mixed opinion about this card honestly. Stamp Sea Otter is a Grade 1 with a par 6,000 power but with an effect that's unique to only itself. It cannot be retired by any card effects whatsoever, and that includes not just Great Nature's main drawback of retiring after a big boost, but also any retiring effects that would be from an opponent like Kagero or Narukami. It's probably the funniest thing when an opponent's Heatnail Salamander tries to retire a full backrow of these Otters and it tries to retire one of these guys all for naught. The thing that I am very weary about is that Great Nature, in general, has a very solid Grade 1 lineup with Hammsuke, Cable Sheep, Silver Wolf, Monoculus Tiger and Coiling Duckbill, so that begs the question of being able to even put in Otter and if so, how many? Personally, I think that's where a person's personal playstyle really comes into play, so if you feel that you can add in a little bit of room for Grade 1's, then I think that this should be a nice candidate. So this is SUPPOSED to be "obscure-promo week" but...this one really isn't that obscure when people are shouting about this guy's awesomeness for Great Nature. From EVERY Great Nature player ever. His skill is really simple. He can't be retired by any card skill. So immediately you have a target to make any retire ability fizzle, as long as you have a choice (think Amon or Gauntlet Buster Dragon). You just pick him and watch them cry. But that's not what he's entirely good for. His ability grants him immunity to the main gimmick of Great Nature; namely, granting 4000 power to something and then RETIRING IT. So as long as you have something that can consistently grant him power such as any of the tigers and/or Leopald, he's essentially a free 10k booster, and so paired with an 11k+ attacker such as Compass Lion (who incidentally can target the Otter every turn and so not -1 every turn anymore) or Magnet Crocodile, you have delicious columns forcing 15k against 11k Vanguards. Stamp Sea Otter really does allow for easy squeezing in of damage for the final push. He's pretty much a Great Nature staple, so prepare to shell out for him if you take that route.